Do not apologize for going in big if that is what it takes. 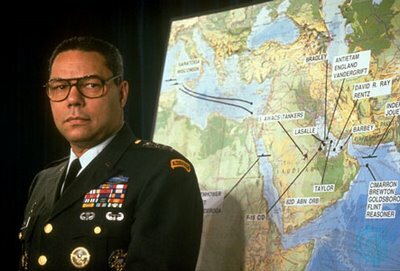 These lessons gleaned from Vietnam to Panama guided Colin Powell for Desert Shield and Desert Storm and benefited all involved. I listened to the audio book as I drove to work and I connected these lessons to our marriages. Do we have a clear objective and are we sticking to it? Are we using all the resources necessary to achieve the objective? Are we living boldly or apologetically? Do we apply effort decisively to overcome obstacles and achieve the objective in order to save our spiritual, emotional, and physical energy for improving and advancing rather than being used up in prolonged guerrilla warfare? What is your marriage objective? How about modeling Christ and the Bride? How are you allocating your resources of time and energy? Are you making progress toward your objective? Are you able to live boldly with your spouse, or are you living apologetically? Are you thriving or just surviving? Are you dealing decisively with and overcoming obstacles keeping you from your objective or are you just hoping they will go away without anyone being offended not realizing the advancement this is preventing? Are you improving or just maintaining? Do you have vision or are you wandering aimlessly? Marriages with vision backed by effort grow to great heights. Marriages wandering aimlessly struggle and often fail. God made us with the need for vision to grab onto, a goal to work toward to discipline and constrain our lives, a standard to use on all the choices of this life to simplify and direct our efforts. Do you see the vision? Do you have the goal? Are you using the standard? Are you focused or aimless? What can you do today to improve your marriage? I bet it’s something in line with achieving your vision. These have been busy and hard days, real days, the last days of my grandfather’s life on this side. He died a few days ago. The funeral is this weekend. Here is a brief look at how he gave to people and his advice for a good life. “Thank you for coming.” These were the last words my grandfather spoke to me from his deathbed—words of affirmation and loving thankfulness following our agreement to meet in heaven. I rushed to the side of my dying Bestafar who clasped my hands and said, “Welcome aboard.” The love in his eyes with those words meant the world to me. Yes, Bestafar. As he was the son of an immigrant Norwegian woman we grandkids knew him as Bestafar, which is Norwegian for grandfather (we recently found out it means the best grandfather). We came, we listened to stories of his life in which I saw him pour his life into others, we received his last advice, and we said goodbye. His father was Irish and had a chicken farm in upstate New York. His mother was a Norwegian immigrant, along with her five brothers and five sisters. Their father changed from Lutheran to Baptist and the oldest brother immigrated to go to a Baptist seminary (he worked his way through, earned his doctorate of divinity, and went back to Norway to be a Baptist minister). The rest of the siblings followed as those here found jobs for them, and the father came too. As a boy Bestafar worked on the farm. His uncles helped him grow—one taught him how to drive a team of horses and another taught him how to drive a car. His mother taught in the area’s one-room school house just down the road and made sure he knew the value of education. He was separated from his father at a young age when his mother left taking him, his brother, and his grandfather to live with his four aunts—all of them teachers or nurses—in a house on Staten Island in New York City. It is suspected she did so because she wanted to continue teaching while her husband wanted to keep her home barefoot and pregnant like so many farm wives. In the city Bestafar participated in Woodcraft—a competitor of Boy Scouts with an American Indian theme. After high school he attended Hamilton College and majored in chemistry. In December of his senior year a classmate burst into the fraternity house announcing Pearl Harbor had been attacked—the United States entered World War II. He graduated and a chemist job literally found him. For two years he worked at Mathieson Alkoli Works, in Virginia, his chemist job excusing him from the draft requirements, until the desire felt by every young man of that age to be actively involved in the war convinced him to enlist. He enlisted in the Army, his poor eyesight made him Class B, and he was stationed stateside. He guarded German prisoners of war—most of whom were friendly and happy to be out of combat—as they did farm work. This was far below his keen mental abilities, he wanted to do more, so he applied for and obtained an assignment of Sanitary Engineer. This turned out to be a recruiting facade for the Army’s secret biological warfare research laboratory at Camp Detrick—a lab with similar secrecy and importance as the Manhattan Project. His team was told to find a way to wipe out Japan’s crops. They succeeded by creating a substance that could be exploded over an area to chemically kill the plants (perhaps the forerunner to Agent Orange in Vietnam and our herbicides today), but the atomic bomb strategy was chosen instead. They cleaned up the lab and he ended up in a base telephone office, cleaning and repairing base communication equipment. During this time he met a nurse in the WAAC into whom he poured his love. She returned his love, they married, and in the usual way children soon came—a son, a daughter, and a son. After the war he poured into young people by being a preceptor for college freshman and then teaching high school physics while obtaining a Masters degree from Colgate University—one of his classmates and friends was Andy Rooney. His Master’s thesis was an evaluation of Colgate’s science programs, asking did they do what they claimed—in effect the student grading the teacher. This required him to know the program inside out which led to a professorship, pouring into undergrads “physical science and baby math” at State University of New York (SUNY) in Oneonta, New York, where his mother and two aunts had previously obtained their teaching degrees. His first child died at age six. Bestafar kept pouring into the people around him. He kept climbing the educational ladder and entered the PhD program at Cornell University. His wife developed some issues requiring long stretches in the hospital, so his mother would come take care of the kids, or if she could not come the kids would be farmed out. To finish his PhD he had to do a one year residency, but his wife’s health declined and took precedence, so he put the PhD on hold, packed up, and drove to Roanoke, Virginia, which had a veteran’s hospital for his wife. He drove in with, “a sick wife, two kids, and no job.” As it turns out, he never was able to finish the PhD. He interviewed with IBM, “took their test, knocked it cold, and had a job.” Showing care for his kids education, they chose a house based on where the good schools were. This was in the early days of computers, and IBM sent him to Washington DC for their basic computer training with punch card programming, to Philidelphia for basic IBM courses, and to Columbia University in New York to take Scientific Programming. With IBM he co-taught in Washington DC the first Scientific Programming course outside of Columbia University. And when IBM installed their computer at Virginia Tech they sent Bestafar to teach programming to the professors and graduate students—he poured into the teachers and leaders. After years of struggle with his wife’s health issues, out of concern for the kids they agreed to divorce, and he took the kids. He was with IBM for twelve years experiencing and advancing the new world of computers until IBM changed strategies and shut down his department. He changed companies to work for Norfolk and Southern Railroad which had been his client with IBM. After thirteen years he retired as head of NSR’s computer division—the early version of Chief Technology Officer. With his daughter in late college and his son in late high school he married a widow he knew through church and poured his life into her and her college-age children as well. His youngest son died at fifty of a heart problem, having earned his Masters at Virginia Tech in chemistry, been a professor, and done many eclectic things. And Bestafar kept pouring himself into the people around him, with a pacemaker addressing his own heart problem. In his retirement years Bestafar poured himself into other people: at church he taught a men’s Sunday School class long past the point he could hear the discussions, finishing his Sunday School teaching career of about fifty years; he won an award for having ran crews for and worked so many hours with Habitat for Humanity over twenty-five years until his deafness and age were too dangerous; he played with his grandchildren; he emailed the extended family profound and funny things; and for three years he daily visited his wife in the nursing home where she lay paralyzed by a stroke—she could not speak, he could not hear, and he cared for her to the end. Now at almost ninety years old with kidney failure and tired of dialysis it was his turn to lay in the same nursing home—cared for by the same staff who cared for his wife—and be visited by family. He poured out his life for his country, for both his wives in turn (he outlived them both), for his kids and step-kids, for all the grandkids and great-grandkids, for students of many ages in many classrooms, for youth and men in Sunday School, and for families with Habitat for Humanity. Bestafar was a man who showed his love by pouring into people’s lives. Will you? Start with your spouse. I like happy old people who have been married their whole life to the same person. This is increasingly becoming a real accomplishment. Say, “I love you” regularly with meaning! Be affectionate with each other. Here are a few reflections on these tips. 1. Use your words. It is not enough to say “I love you” at the wedding and think that will suffice for all time. Both husband and wife need to meaningfully say these three words to each other, daily if possible. And it is possible. 2. Use your actions. Respect each other. This translates into honor, courtesy, looking out for their interests, and behaving in such a way that they are confident you will always care for them. 3. Use your hands. Affection is the atmosphere where events of love happen. Be physical with each other! Not to the point people tell you to get a room, that’s what home and special getaways are for. Play nice and be appropriate, but be clear at home and in public that you like each other! Broadcast to your spouse and all those watching that you two are an item! 4. Use your mind. Keep the mindset that each day is new. Do not take each other for granted. Appreciate your spouse. Be thankful for the things your spouse does for you and for your marriage. 5. Use your spirit. Something my friend did not talk about but displays in his life is the unity of spirit he has with his wife. To go the distance you must believe in the same God and agree what that looks like in your life. You can do it! Follow these simple guidelines and in a few decades you too can look back sixty plus years to your wedding.